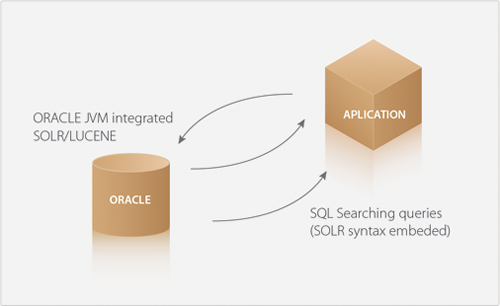 implementation of the market standard solution Solr/Lucene inside Oracle Engine adding transactional and security features. Near Real Time update/insert, Real Time deletes. Our unique push technology can capture automatically your relational data changes and automatically keep in sync an external searching instance. Like Scotas Solr Push connector if you need Solr searching facilities but with elastic deployment the ElasticSearch Push Connector is the solution for your application. ElasticSearch is an Open Source (Apache 2), distributed, RESTful and designed for the cloud search engine built on top of Apache Lucene. Scotas ElasticSearch is a connector which keeps your SQL data in-sync with your ElasticSearch out-of-the-box installation using JSON over HTTP. It also provides query facilities in SQL by adding new relational operators and functions. Solr Push Connector provides a near real-time free-text search solution which can be integrated really easy on any website or application. You can start with one machine and scale to hundreds. 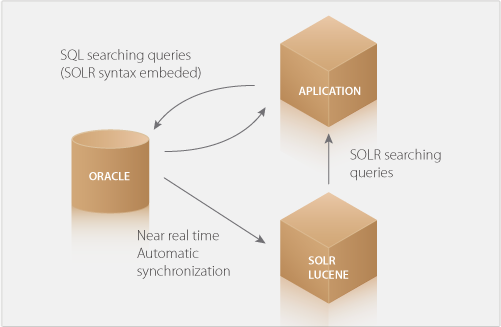 This is a two-way connector which integrates Oracle database with Solr/Lucene search engine. Sends data to the Solr out-of-the-box installation via JSON over HTTP. Consumes data during query time with new SQL operators and functions. This connector does not require the Oracle internal JVM since it is developed completely on PL/SQL. It also works on Oracle 10g express, 10g standard and Enterprise Edition and any 11g installation. Which Scotas product fits your needs?